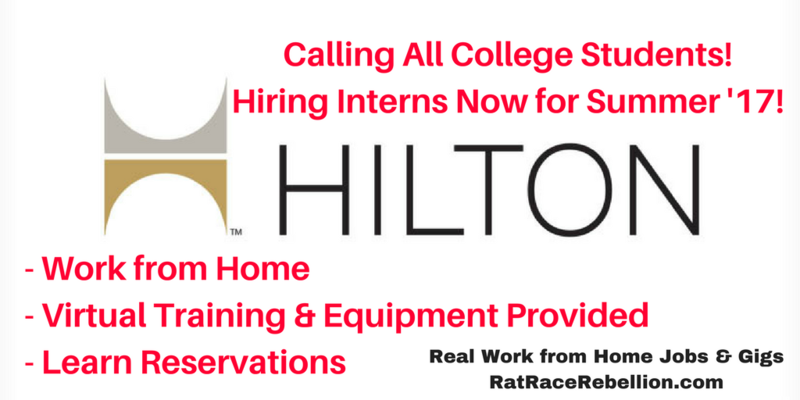 If you’re a college student, Hilton is hiring work from home Interns for jobs this summer. You’ll be trained and working as a Reservations Sales Intern. Hilton provides desktop terminal/hard drive, monitor, webcam, keyboard & mouse, headset, flash drive, speakers, surge protector, Ethernet cable, and VoIP phone line. Requirements include six months of job experience where you interacted with people. You’ll need a high-speed wired Internet connection and a quiet home office. You’ll also need to be available for a 40-hr. week. The internship will last 10 weeks during the summer of 2017, from June 5-August 11, with orientation on May 31. The rate of pay isn’t mentioned, though part-time Reservations Agents at Hilton earn up to $13/hr. or more. Even if pay is lower, however, this looks like an excellent opportunity to get useful experience with a leading brand, and you get to work from home. Extra credit on your application if you work well with people, or have had a work from home job before, or taken virtual training. To go straight to the job, click here. Good luck! This entry was posted in Work at Home Jobs and tagged Hilton. Bookmark the permalink.